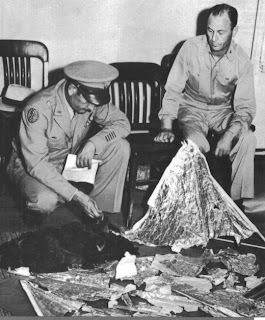 The five or six years after World War II saw a global UFO flap that was never seen in all history; in a sense this flap is still going on, although it has decreased slightly since the early 50's. This flap coincided with two very significant developments in human technology: nuclear weapons and space-rockets. Put the two together and it's understandable that any extraterrestrial community would be concerned by this! We're a species taking the first steps beyond our home planet, but we're still exhibiting aggressive and acquisitive behaviour; we're a serious threat to Galactic peace! The post-war flap, as I said, covered the world, but it seems to have been centred in a particular region: the central United States, specifically New Mexico. This was probably because it was the site of both the White Sands space-rocket development centre and Roswell AAB, the home base of “Enola Gay” and the 509th bomber squadron, the only nuclear armed unit in the world at the time (supposedly!). It was in New Mexico that the highlight of the extraterrestrial showcase took place: Roswell. However, anyone who delves beyond shop-window UFOlogy will soon find that Roswell was just one of many instances in which a UFO came to grief on the Earth's surface and was secretly salvaged by the authorities. Maybe it doesn't even deserve to be the most famous. In 1950 the journalist Frank Scully (Any relation to the X-Files' Dana!?) published the book Behind the Flying Saucers. Now long out of print and virtually forgotten, it was the first in the long genre of UFO conspiracy books. It was a massive best-seller and maybe deserves a more prominent spot in UFO investigations. The books contained the revelations of an intelligence contact Scully called "Dr Gee". Dr Gee's information is that just a few months after Roswell another UFO crashed in New Mexico near the small town of Aztec. He spoke of how the military had moved in on the site and sealed it off. 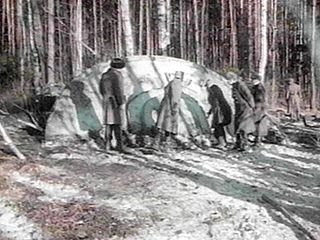 The UFO was a metallic disc 100 feet across made of very thin and light, but very strong material, just like the one at Roswell. The recovery crew managed to gain entry to the craft through a broken window and even dismantle it once they found out how. It seemed to be built in a modular fashion, designed to come apart. The separate modules were loaded onto flatbed lorries and driven through the night to an airbase where they were taken to Wright-Patterson AFB, the most secret base until Area 51 was built in the 50's. They also found 16 alien bodies inside the craft which were examined by military pathologists. They were said to be small, 37-42 inches in height, but humanoid. They also looked like they’d been burnt slightly. The book has been denounced as a hoax in many circles seeing as Scully wouldn't identify Dr Gee or produce any hard evidence to back up the story, but according to Bill Steinman, this is no longer the case. He has it on record that there was a sighting of a 100ft disc on the 25th of March 1948 and it was picked up by three separate radar posts. This gave the military skywatchers a very accurate triangulation and it crashed at Aztec right where Scully said it did. If “Dr Gee” was still alive in 1987 when Steinman made his statement then maybe he is the same source. I wonder what the Project Blue Book director, J Allen Hynek, would have called this phenomenon. He is the UFOlogist who coined the phrase “Close Encounters of the Third Kind” and was a consultant to Stephen Spielberg’s film of that title. “Fourth” and “Fifth” have already been taken by the exopolitics movement to refer to contact initiated by the aliens and contact initiated by humans. I suppose “Close Encounters of the Sixth Kind” will have to do! There may be “Seventh” and “Eighth” too; the list is not exhaustive. The moral of this story is that we need to keep watching the skies, but also give the ground a quick glance now and again, because we never know when and where the next Roswell will happen. It could be where you live! It's been a busy day on HPANWO with three new articles. When you've read this one, don't forget to scroll down to the others.